In a rainswept Burbank parking lot, the 24-year-old, luxuriantly ash-blonde Imp Girl sits in a regulation canvas chair awaiting her next take. She folds her dress and shawl about her, and stares at her damp high-heel shoes. It’s late January 1910, and in keeping with current fashion her already pale face, with its aquiline nose and merest hint of a cleft chin, has been caked with a perhaps over-generous touch of makeup; her eyes peer out from this raccoon mask to the somewhat flimsy-looking script on her lap. The property in question is called The Broken Oath, and proves to be an engaging if not elevated melodrama in which the heroine saves her male companion from a sorry moral decline. It will change the course of movie history. While the cameras were still rolling in Burbank, a middle-aged, cigar-chewing entrepreneur named Carl Laemmle was hard at work on the promotional side of the enterprise. 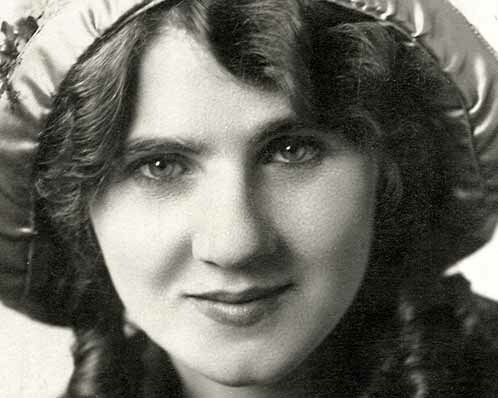 The German-born Laemmle was head of his own film production business, the Independent Motion Picture Company of America, also known as IMP, and the “Imp Girl” — Florence Lawrence — had recently signed on after a three-year, roughly 100-film career for the Edison, Vitagraph, and, latterly, D. W. Griffith’s Biograph concerns. Laemmle promptly came up with a classic piece of disinformation, planting the fictitious story that his leading lady had been killed in a street-car accident. The press swallowed it whole, which then allowed Laemmle to take out a full-page announcement in the March 12, 1910 edition of Moving Picture World, indignantly headlined “We Nail a Lie,” and assuring the public that Miss Lawrence was not only alive and well, but would soon be opening in a “ground-breaking new picture” (which was alas misspelt in the paper as The Broken Bath). It worked. When Lawrence subsequently arrived for the film’s premiere at the Grand Opera House in St Louis, both she and her leading man, King Babbott, were mobbed by a crowd of fans, “who tore buttons off of the stars’ coats” according to film historian Robin Cross. It was not only the first successfully staged media stunt involving a film actress, it was the beginning of the star system as we know it today. Lawrence had her name and face plastered over billboards and marquees wherever The Broken Oath played, and came to enjoy a degree of popular fame hitherto reserved for the likes of Teddy Roosevelt or the occasional touring European opera diva. Only a few weeks later, the arid and unloved suburb of Hollywood was formally annexed by Los Angeles, which at least had the good fortune to enjoy an ample supply of water. Not only did the area provide for year-round filming conditions, but also conveniently supplied settings for desert, jungle, or city alike, not to mention a non-union workforce that accepted half the going New York pay scale. In early 1911, the Nestor Company opened the first local full-service film studio in an old tavern at the end of Sunset Boulevard, swiftly followed by the arrival in town of Cecil B. DeMille. Within a year, Laemmle was able to merge IMP with eight smaller organizations to form the Universal Company, the first such to combine film production and worldwide distribution services. A system — and a star — were born. It was not ever thus for the glamorous but constitutionally brittle Miss Lawrence. 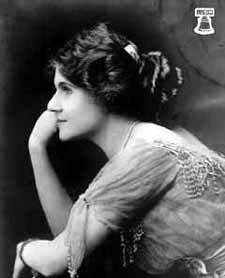 She was born, as Florence Annie Brigwood, on January 2 1886 (some sources say 1890) in Hamilton, Ontario. Her father left home when she was four, and she took the pleasingly euphonious surname of her mother, a vaudeville actress; the two occasionally hoofed it on the Canadian stage together, with the child billed as “Baby Florence, The Kid Wonder.” Mother, daughter, and two sons then moved to Buffalo and eventually to New York City, where Florence displayed an aptitude for horse-riding and other athletic pursuits. In 1906, at twenty, she appeared in her first motion picture, a hastily cranked adaptation of Macbeth, a part she landed by answering “Yes” to the question, “Can you ride?” Some 38 further movies appeared over the course of the next twelve months. Many of these roles, it would be fair to say, relied more on Lawrence’s equestrian skills than they did on any discernible dramatic talent. In late 1907 she came to the attention of a 33-year-old failed actor and writer, now trying his hand at direction, named D. W. Griffith. Griffith gave her the starring role in The Girl and the Outlaw, and put her on contract at a heady $35 a week. She made 57 films directed by Griffith in 1908. The money rolled in, at roughly twice the then going rate for a leading lady, but despite her material success Lawrence remained largely anonymous. At the time, actors (let alone actresses) were rarely promoted by name, and she was simply known as “The Biograph Girl.” All that changed when the 43-year-old Laemmle, a fast-talking veteran of the Nickelodeon circuit, appeared on the scene, spending unprecedented amounts on publicity and actively glamorizing his stars. 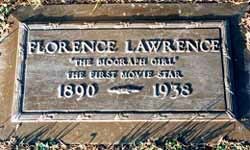 In 1912, Lawrence made a deal with Laemmle that allowed her to form her own company, from which she earned an astronomic $500 a week, a Bill Gates-like income at the time. It’s hard to convey now, when the epithet “great” is applied to every surgically altered ingénue who appears over the horizon, just how popular she was. The press and public couldn’t get enough of her. Lawrence was routinely mobbed on set, and her postman suffered a nervous seizure from hauling all the sacks of fan mail to her door. When in restaurants, she learnt to hurry out the kitchen door and make her way to safety down roped-off streets. Charlie Chaplin asked to meet her. Lawrence was soon able to realize her “lifelong dream” of buying a 50-acre estate in River Vale, New Jersey, where she grew roses and claimed to have retired. Despite this, she went back to work for Laemmle in 1915, but fell and badly hurt herself when making a film called Pawns of Destiny. Laemmle declined to pay her medical expenses. Later in the year, Lawrence was burnt about the face and neck when a staged fire got out of control and she rushed back through the flames to rescue a co-worker. Six months and several crude plastic-surgery procedures later, she returned to work but collapsed after completing a film called Elusive Isabel. Lawrence was probably suffering from what would now be called post-traumatic stress syndrome, if not full-bore depression; at the time, she was just thought to be difficult. Lawrence had become a movie star for many reasons — gentleness, grace, that silky hair, and what Laemmle assessed as “sensational bubbies”— but The Broken Oath tapped into what may have been the most powerful part of her appeal. In the film, which has no great artistic pretension but does enjoy a healthy undercurrent of sexual force, Lawrence more than once takes the opportunity to stare long and hard into her co-star’s eyes, her own gaze raging with love and kindness. She is a noble woman whose strength and grace are mirrored in her every movement. It’s the sort of intense, if slightly histrionic performance that might draw Oscar nominations today but that also, perhaps, bespoke a certain inner fragility that over time would be fully exploited by a succession of hard-nosed studio bosses and unsuitable husbands, making her a kind of prototype Marilyn Monroe. There was rather more to Lawrence, even so, than a prominent embonpoint and that fetching combination of sexual allure and vulnerability. As even one or two of her more churlish critics allowed, beneath the elaborate coiffure lay distinct signs of intelligence. Having taken possession of her first automobile, a rarity at the time, she not only learnt to drive competitively, entering several endurance races, but soon came up with a device most of us take for granted today. Lawrence’s invention was none other than the humble turn signal, which in its early incarnation was a polished metal strip attached to the car’s rear fender. When the driver pushed a button, the strip shot up, with an arrow attached indicating the direction of the intended turn. Following this, Lawrence developed a brake signal based on the same rudimentary but effective principle; when the driver slowed down, a sign unambiguously reading “STOP” emerged to warn those following behind. It was somehow typical of her trailblazing but ultimately pitiable career that Lawrence failed to patent either of her inventions, and thus never benefitted financially from them. In 1939, the Buick company launched what it trumpeted as being the “first electrical device to indicate a vehicle’s turning,” with no acknowledgment, either then or subsequently, of Lawrence’s pioneering role. When Lawrence went back to work (on a picture called The Slave) following her nervous breakdown, dozens of enquiring reporters — “muckrakers” they were called back then — from San Diego to Seattle were waiting for her. They crowded the Universal lot when she pulled up in what was described as “a vehicle the size of a luxury yacht,” and strode confidently toward the cameras. The press wanted to glimpse the plucky but apparently brittle little woman who had become an international symbol for both the glamour and hazards of the fledgling film industry. Alas, the second act of Lawrence’s career rarely lived up to this promise, even if it makes for an unbeatable morality tale of its kind. Her professional comeback was only modestly successful, and within a year she was reduced to taking small parts, mostly from sympathetic directors who remembered her early films. In the mid-1920s she developed (again, decades ahead of the curve) her own cosmetics line, but the venture failed; the Stock Market crash and ensuing Great Depression accounted for the rest of her fortune. Unsuccessful commercially, she was no luckier in love: Lawrence married first her frequent co-star and director Harry Salter, whom she divorced following her injury on Pawns of Destiny, which she said he had helped cause by forcing her to do a dangerous stunt. Next came a car salesman named Charles Woodring, but he died prematurely in 1930. Finally in 1933, aged 47, she married one Henry Bolton, an alcoholic who routinely beat her up; the union lasted only five months. Lawrence once again returned to the screen in 1936, when MGM began a policy of giving small parts to old stars for a charitable thirty or forty dollars a week. The results were less than mutually fulfilling. By then Lawrence was suffering from myelofibrosis, a debilitating and eventually fatal bone marrow disease, and living in a vermin-infested two-room apartment in West Hollywood. She continued to be good copy, holding forth on everything from Hitler to the cultivation of roses to the few reporters who still remembered her, but it was clear that she had long outstayed her welcome as far as the general public went. Lawrence spent Christmas of 1938 alone, and apparently in acute physical pain. On the night of December 27, she lay down in bed, having arranged her few remaining possessions and professional souvenirs in a sort of tableau around her, and ate a jar of ant poison washed down by cough syrup. Lawrence was found the next morning and rushed to hospital, but died there later that day. She was 52. Christopher Sandford is the author of three novels and a series of rock and movie biographies including Mick Jagger (1992), Eric Clapton (1994), Kurt Cobain (1995), David Bowie (1996), Bruce Springsteen (1999), Steven McQueen (2001), Paul McCartney (2005), and Roman Polanski (2007). His biography of Polanski is now out in paperback. 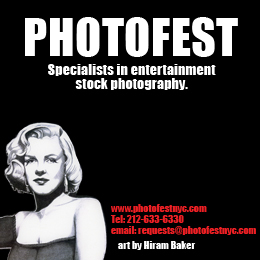 One or two of the above, notably Cobain, have been optioned for film. 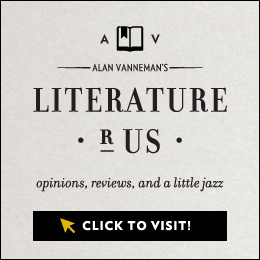 His latest book is Harold and Jack: The Remarkable Friendship of President Kennedy and Prime Minister Macmillan (Prometheus Books, 2014) and Masters of Mystery: The Strange Friendship of Arthur Conan Doyle and Harry Houdini (Palgrave Macmillan, 2011). The British-born author calls Seattle and London home.